Almost a week has passed and I think we can all agree that there are many lessons to be learned from the recent "dust-up" at the Lincoln Memorial involving teens on a "March For Life" field trip and a Native American celebrating Indigenous Peoples Day. Who was right, who was wrong? I don't have an answer. I merely have an opinion. Were some of us too quick to condemn a group of 14 and 15 year olds? Quite possibly. Have others labeled Nathan Phillips a "professional protester"? Most certainly and we can focus on the plight of the Native American at some other time, today let's just focus on what we saw this past weekend. By now I believe we've seen all the video evidence. The "long version," the "short version" and still we have differing opinions. What I haven't seen personally is footage from the "March For Life" which took place in a different area of the National Mall. I'm curious to know how the kids from Covington Catholic behaved themselves there. Did they participate in "school chants"? Did they "get in the faces" of the opposition? I'll tell you why I ask this question later, but for all intents and purposes there is nothing to indicate they did anything untoward. However, the question has been raised "what are a group (of impressionable) kids from a private Catholic school doing at a "March For Life Rally" in the first place? It seems that students who march out of school for a day to support the "Me Too" or "Black Lives Matter" movements "...should be in the classroom learning English and Science." 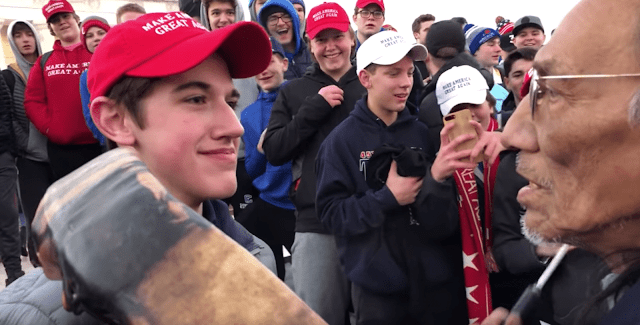 The long and short of it is that some people think Mr. Sandmann, the Covington Catholic student (with the "smirk" on his face) was being disrespectful. I personally believe he may have been better served by stepping aside and allowing Mr. Phillips to beat his drum elsewhere. Did he have to? No. He stood toe to toe with a man many years his senior and didn't flinch. That was impressive! Did he antagonize Mr. Phillips in any way? That is the underlying question and where opinions differ. Although we will never know the answer, were Mr. Sandmann to step aside and Mr. Phillips then continue to beat his drum in the young man's face, blame for the escalation of the incident could have easily been attributed to Mr. Phillips. But that's not what happened. Emboldened by his classmates who, despite what many have insisted to the contrary, did begin mocking the song Mr. Phillips was singing and did mimic the "tomahawk chop," Mr. Sandmann stood steadfast. He held his ground, which is something I've encouraged my children to do. I've also encouraged my children to be kind, respectful and dignified. In defense of Mr. Sandmann, was he scared? Probably so. Did he fear some sort of escalation? That is what he indicated in his press release. Finally, did Mr. Phillips have to beat his drum in the face of Mr. Sandmann? No. So who is right? I had a discussion with a friend of mine who insisted that Nick Sandmann, the young man at the center of all the attention, is..."only 15." Yes, he is "only 15" and it is my hope that at a private Catholic school and all schools for that matter, students are taught to respect the lives of their elders be they Native American or not. One might argue that is no longer happening. I certainly believe it to be true that much of the blame for escalating the conflict can be attributed to the Black Hebrew Israelites and the disgusting things they constantly shout to all within earshot. This type of protest does nothing but convince me to turn you off. Your message -- when wrapped in hate -- does not get through to me. Above I asked "did the (Covington Kids) get in the faces" of the opposition during the March For Life? (A protest for which no video has yet surfaced.) Let me explain why I ask such a question. For 32 nights during the Christmas holidays I participate in a fun, festive celebration called "Snowflake Lane." Families come from miles around to take in the lights, decorations, floats, drummers, dancers, etc. and each year a group of "professional protesters" arrive to shout loudly that those in attendance, the 3, 4 and 5 year old children, as well as everyone else gathered, are "going to hell" because they're excited to see Santa. Having no idea whether those in attendance are at peace with God or whether they are Christian or not? Other protesters are "Pro-Life," some are there holding up grotesque signs in an effort to have us change our eating habits. That is their right and very seldom does anyone stand in their way staring them down. I wonder why then that a man peacefully beating his drum and singing wouldn't have been allowed to walk up the steps of the Lincoln Memorial if he had chosen to do so and is instead considered an "instigator" by some? Many will have a different opinion than mine and I appreciate that more than you know. I learn much from those who share their opposing views in an articulate manner. It is a right afforded us all by the Constitution of The United States and that in itself might be the lesson best learned from this particular incident. Mr. Oxford, my takeaway from your article is that you believe both the student and the drummer had equally valid points of view. One was pursuing his tradition. The other was displaying teenage macho for his friends. The elder man did not drum in the face of the younger as a challenge, but rather that face was placed in front of the drummer on purpose so he could not peacefully proceed. I don’t find it “impressive,” as you put it, except in the sense that I would never teach my children to be disrespectful. In my opinion, the young man wasn’t standing up for some noble cause. He should have just stepped aside and left before this whole thing blew up. Now that would have been impressive. thank you for your comments. I don't know if I agree or disagree which is a credit to your attempt at fairness. However, I don't it is odd for students to 'miss' a day of school to go to the Righttolife march. It is highly educational event in civics. They likely learned more that day than sitting in class. I don't know why you expect young teenage boys in a large group to be polite. Only because that is the way I have raised mine. Many "large groups (of boys)" are able to conduct themselves appropriately. Thank you for reading my article and for your comment. Remember this boy of which you are speaking is a JUVENILE. Lots of big tough people picking of a high school student. I believe that Nick Sandmann had and still has the right to express his opinion. If he wants to do those things that he did as long as he does not threaten the drummer then I am ok with it. Go Nick!